Q: Am I allowed to divide up the pull-ups, pushups, and squats or do I have to do them in order? Q: How often should this workout be performed? A: One to two times per year is plenty. Many CrossFit gyms have a tradition of performing Murph on Memorial Day. Murph is a great test of your endurance and mental toughness, but consider it a benchmark of your fitness rather than a workout you would perform on a regular basis. Q: What style of pull-ups can be used? Are chin-ups allowed? A: Either/any method is accepted. Although the workout says “pull-ups”, in CrossFit Land kipping is allowed unless it is specifically excluded (e.g. “strict pull-ups”). Also, there usually is no distinction made between pull-ups and chin-ups. The standard is typically to go from a hanging position with the arms completely extended to the chin breaking the horizontal plane of the bar (check the masters standard for pull-ups from the 2011 CrossFit Games Event 6). Many people will change up their grip across sets as a way to try to give some muscle groups a bit of a rest. Q: Are the push-ups done “hand release” style? A: No. Standard push-ups are the norm. Chest to deck. Q: How did Lt. Michael “Murph” Murphy perform the workout? A: Unknown. Reviews of the CrossFit message boards and other sites has not provided a conclusive answer. If you have any information on this please email contact@functhat.com. 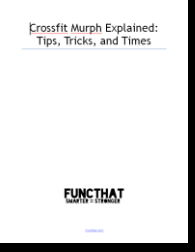 Looking For More Info About The CrossFit Murph WOD? Posted on I love that after picture! You cant get that muddy and not have fun.and Im alayws amazed that I can walk into the gym in the morning, tired, not in the mood to workout at all, see a wod on the board that I cant even do Rx, and still walk out afterward feeling 100% better and in a great mood. Maybe it’s the peeps at the gym, maybe it’s crossfit, maybe its both, but whatever it is, I hope it doesnt stop! I love you guys! (and no Im not drunk).